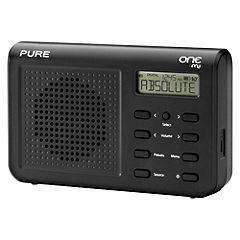 Pure One Mi DAB Radio in Black, only £19.99 @ Sainsbury"s.
Click and collect or £3.95 postage. Worth a thread at under £20 i thought. The Pure One Mi is a palm-sized DAB/FM radio, so whatever your choice in digital radio, you can take it with you! There are 16 presets for your favourite stations, while a LCD display with RDS makes finding new radio stations easy. The radio takes an optional ChargePAK A1 for portable listening, while there's a USB port for product upgrades. Low power use on standby means that it's always ready to go. Was very tempted to buy this the other day. The only downside is the non-replaceable battery. was £25 in tescos when i was looking for a radio before xmas so this is a nice saving if you click and collect. Was very tempted to buy this the other day. The only downside is the … Was very tempted to buy this the other day. The only downside is the non-replaceable battery.
" non-replaceable battery" But it takes an optional ChargePAK A? Can anyone recommend a DAB radio with timer recording built in please? Lots of batteries for this on Ebay but about £20! Does anyone own this model? I need a DAB radio for my garage, but reading the Amazon reviews (and ignoring the one-star "hurr durr, I thought portable but can only the mains. battery rip off!" comments), there do seem to be a lot of people awarding three or four stars due to poor sound quality. I appreciate this is a small, cheap radio, but every other Pure product I've seen, including bedside clock-radios have sounded pretty darn good. Heat added regardless. Great price, great deal, and nectar points too! Update: Ordered one. What's the worse that can happen for £20? I can always return it. Thanks OP! "Can anyone recommend a DAB radio with timer recording built in please?" The Pure DMX 50 has this - I have one - and records to SD card. It is more of a mini stereo though but I have it in the kitchen and doesn't take up much room. Not portable though.
" non-replaceable battery" But it takes an optional ChargePAK A?Can … " non-replaceable battery" But it takes an optional ChargePAK A?Can anyone recommend a DAB radio with timer recording built in please? Roberts and Pure have more models that record DAB radio, have a look on their websites. DAB generally sounds very poor in my experience, it's a very badly implemented digital radio system, it really needs an update to a much better system. Ive got one of these and to be honest they are very cheap light flimsy radios and the sound quality was quite poor (what can u expect from 1 speaker I suppose) mine drops the channels quite a lot too. We had one in the office the other day and it looked like it would take normal batteries as well as the optional battery pack. I'm not 100% sure but that's how it looked. "DAB generally sounds very poor in my experience, it's a very badly implemented digital radio system, it really needs an update to a much better system." Yeah and CDs sound so much worse than vinyl, DVD is not as good as VHS - go to your potting shed and enjoy your wireless grandad! "DAB generally sounds very poor in my experience, it's a very badly … "DAB generally sounds very poor in my experience, it's a very badly implemented digital radio system, it really needs an update to a much better system. "Yeah and CDs sound so much worse than vinyl, DVD is not as good as VHS - go to your potting shed and enjoy your wireless grandad! You'd be surprised how much truth there was in that saying that CDs sound worse than vinyl. Hmmm think you need to do your research. The bit rate used by the majority of stations on DAB is very low making the sound quality pretty poor. The other poster is right in saying that sound quality isnt great. It's a fact that FM sound quality is better than DAB. .....and £19.99 will buy you a much better sounding FM radio than this tiny DAB one. "Can anyone recommend a DAB radio with timer recording built in … "Can anyone recommend a DAB radio with timer recording built in please? "The Pure DMX 50 has this - I have one - and records to SD card. It is more of a mini stereo though but I have it in the kitchen and doesn't take up much room. Not portable though. As a matter of interest, does the CD player on yours still work properly? The one on mine died shortly out of warranty, a common problem judging by the Amazon reviews for the 50 and 60. Apart from that a very nice unit, but as you say, not portable - and very few stations bother transmitting EPG data, making recording a bit of a faff. DAB generally sounds very poor in my experience, it's a very badly … DAB generally sounds very poor in my experience, it's a very badly implemented digital radio system, it really needs an update to a much better system. It depends what you listen to. For speech radio, I find it fine. I like radio 5, talksport, etc. which are terrible on MW so DAB is far superior to analogue for me. Even for music, I find it OK. I understand people say that it is a low bitrate, but I still find it acceptable for radio. FM in my area has quite a bad signal to noise ratio, and so for me DAB is far superior. Well, when listening on a reasonable system (e.g. my PURE DMX-50) the audio quality is fine on the stations I listen to (Planet Rock, 6 music, Absolute ) They really could do with upping the transmit power though, there's nothing worse than a borderline DAB signal. I've had rubbish sounding FM portalkes and good sounding FM portables. With a blank sheet of paper then yes they could do much better than DAB, but with an installed base of over 10 million radios I can't see it being switched off in the medium term. It's a fact that FM sound quality is better than DAB......and £19.99 will … It's a fact that FM sound quality is better than DAB......and £19.99 will buy you a much better sounding FM radio than this tiny DAB one. Depends totally on reception conditions where you;re using the radios - hissy FM stereo annoys me more than supposedly low bitrate DAB. Hmmm think you need to do your research. The bit rate used by the … Hmmm think you need to do your research. The bit rate used by the majority of stations on DAB is very low making the sound quality pretty poor. The other poster is right in saying that sound quality isnt great. What does pretty poor mean though? Ofcom did a survey and the results were that most people surveyed perceived that DAB was good, very good or excellent (with the same for FM). There are some audiophiles that expect the absolute best or say that something is rubbish and not to be tolerated. If the same happened with cameras, then digital would have never taken off. Film is superior to digital in photography, yet convenience of digital has meant that film has for the most part died out except for professional use. Even though the technology is worse quality, it is still perceived as good enough and the extra convenience and lower costs of digital means that it wins with the public. For me, DAB (and internet radio, which is often a similar bitrate) is more convenient - quicker to tune, many more stations available, no hiss due to poor signal to noise / interference. I find it acceptable quality. It may not be the best, but perfectly acceptable. Just like digital photography compared to film. I bought a PURE ONE Mi a few months ago for slightly less than this (£15+VAT at MAKRO) - yes it is a little tinny in tone but is a good DAB/FM radio and ideal for travelling. I recently bought a compatible CharePak to extend its use beyond the mains from mdsbattery.co.uk/sho…287 - it seems to be working fine. If you can find a Pure Bug or Pure Bug Too, those are awesome units, design of them is marmite, sound quality is good with stereo speakers and they not only timer record through an EPG to SD Card they also have the pause/rewind live radio feature "ReVu"
These units are quite old now though, and do not support DAB+, but that is not an issue for quite the foreseeable future. I looked this up on the Which? website. The Pure One Mi is cheap for a DAB digital radio. It's a simple looking unit, with few buttons and controls. We put it through our test to see whether it produces a decent sound. The One Mi is unlikely to win any prizes for looks, but it's a tidy, compact package. It's easy to use, so you can be listening in moments - plug in, switch on and the radio scans for DAB stations. But sound quality isn't great, but this is a small radio and its simplicity means its use is restricted. The One Mi has a telescopic aerial which is easy to position and retract if you want to use the radio in a different room. It's light and you can get your hand round it, so it's easy to carry. You can use it connected to the mains, or away from the mains if you purchase a Pure ChargePak A1 battery which fits in the battery compartment and charges inside the radio. The instructions aren't the most helpful, but if you've ever set up presets on other radios you shouldn't find it difficult. In the preset function, pressing and holding the 'select' button saves the station. The buttons all click a little when you press them, so you get an indication through your fingertips when you've pressed something - handy in the dark. Sound quality isn't great - it's fine if you just want some background noise, but if you want a level of enjoyment from the quality of the sound, this model isn't for you. It sounded slightly muffled and thick in the mid-range. Our experts noticed some cabinet resonance issues - slight buzzy sounds caused by thet radio's cassing - and described it as sounding 'tonally restricted'. There are 16 volume levels and you can turn it up loud enough to fill a room, though we thought it lacked gusto with some quieter stations. There's no headphone jack or audio output or input, so you can't play DAB radio from the One Mi through your stereo, or play music from your MP3 player through the radio's speaker. The small display isn't backlit and there are no alarm settings, so it's not suitable for use as a bedside radio. However, the time continues to be displayed in standby. Cons: Below-average sound, no bedside features or dedicated preset buttons, battery purchased separately. May be of some help!!!!!! If you look at the Sainsburys customer views alone, you wouldn't buy one. I'm no surprised they've reduce this. No point in cheaping it up when it comes to DAB. You won't get the benefit of the quality. This one is better for the same price. What does pretty poor mean though? Ofcom did a survey and the results … What does pretty poor mean though? Ofcom did a survey and the results were that most people surveyed perceived that DAB was good, very good or excellent (with the same for FM). There are some audiophiles that expect the absolute best or say that something is rubbish and not to be tolerated. If the same happened with cameras, then digital would have never taken off. Film is superior to digital in photography, yet convenience of digital has meant that film has for the most part died out except for professional use. Even though the technology is worse quality, it is still perceived as good enough and the extra convenience and lower costs of digital means that it wins with the public. For me, DAB (and internet radio, which is often a similar bitrate) is more convenient - quicker to tune, many more stations available, no hiss due to poor signal to noise / interference. I find it acceptable quality. It may not be the best, but perfectly acceptable. Just like digital photography compared to film. But it's not exactly like photography is it? You can choose to buy a cheap camera (or phone) with a small sensor and low resolution and get a mediocre result or spend loads and get a professional full frame DSLR which offers quality as good as 35mm (but admittedly not large format) film. You pays your money and you takes your choice. With DAB radio you can buy quality in terms of better speakers but you cannot control the bitrate under any circumstance. And it varies depending on content. Classic FM and Radio 3 generally broadcast at 160kbps which is close to but not as good as clear FM. Speech and pop stations such as Five Live or Absolute Radio a poor 64kbps in glorious mono. I think the now defunct Traffic Radio was actually 32, just slightly better than a mobile phone to my ears. Bandwidth costs money and the judgement is based simply on what you can get away with - if the Ofcom survey is representative then indeed it's good enough for most people. But what’s driving all this? I don’t accept the cost or convenience notion. It’s only recently that the high price of digital radios has started to fall anywhere near the cost of an analogue, and battery life is shockingly bad. An FM radio left on will play for days, possibly weeks, a DAB six to eight hours with alkalines , a few more with a chargepak. Where’s the convenience in that? The government stands to make a lot of revenue from the sale of analogue bandwidth and I think this may just have a bit more to do with it than ‘progress’. Let’s also not forget the number of largely obsolete FM units in our potting sheds created by the proposed 2015 switch-off. Over 50 million apparently. Will they all fit in the same big hole in the ground as the film cameras? An excellent perspective. Heard the same arguments down the years MP3 won't supplant CD. DVD wont supplant laerdisc. All because quality was lower. But convenience wins everytime. I've got DAB and FM radios. I'm not relgieous about it in any way. DAB is good quality to my ears. Its more prone to cutting out in the car, and DAB radios eat protable radio batteries. Horses for courses, but people do love to hate on DAB. Its a bit of a marmite technology. In reply to the various comments regarding my earlier post, I stick by what I said. DAB could have been so much better, what we actually have is a generally poor quality digital audio transmission system. Digital does not always equal better. Sadly you could spend £1000000 on a DAB radio if one existed and the quality still wouldnt be good as the signal being sent is of a lower bit rate. I love DAB, the chocie of stations is fantastic but the quality of the signal is terrible. Flicking between FM and DAB for the same station, the sound is much better on FM with the exception of Classic FM. Talksport and Radio 5 live are for me the only reasons to have DAB, and the ability to record(which this DAB doesnt have). Mixed reviews on the Sainsburys site, and with the battery pack it's bumped up to £40! Doesn't look much of a bargain to me! If you can find a Pure Bug or Pure Bug Too, those are awesome units, … If you can find a Pure Bug or Pure Bug Too, those are awesome units, design of them is marmite, sound quality is good with stereo speakers and they not only timer record through an EPG to SD Card they also have the pause/rewind live radio feature "ReVu"
Agreed. I got the first gen. Pure Bug, which Morgan was selling off for about £40 for ages while it still had a shopfront on Oxford St. Loud and relatively distortion free. The only real difference between it and Pure Bug Too was the firmware, which was freely downloadable from Pure's website. I noticed that bitrates have been lowering from the early days of DAB. Clearly, broadcasting costs more than the advertising revenue it brings in.